KANSAS CITY -- The drive didn't end how any of the Houston Texans had hoped, but the young, inexperienced quarterback got into the huddle and urged his teammates with confidence. 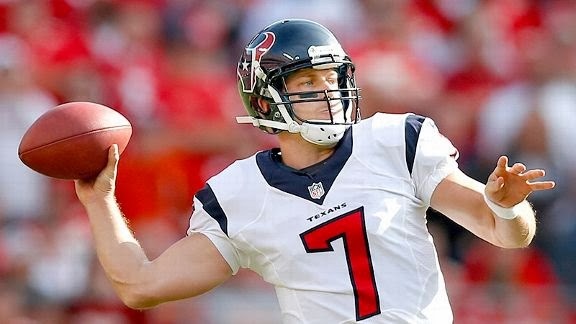 "Let's take it 99," Case Keenum said, as Texans center Chris Myers recalled. It was the fourth quarter of a game the Texans' trailed by one point. Their net gain was negative-1 yard that quarter and that particular possession was their only fourth quarter possession with positive yardage. It ended in a punt after Keenum was sacked. "I told him before the game, keep everyone upbeat," Myers said. "Everyone enjoys an upbeat huddle." For a first outing, it showed promise. And it leaves the Texans with a tough decision for their next game. "Energetic, excited, ready to go," running back Ben Tate said of Keenum. "Natural born leader." Keenum was poised. It wasn't apparent this was the first time he'd played in a meaningful game since his sixth and final year at the University of Houston. (Keenum insisted last week that the preseason games in which he's seen action since then are meaningful, too.) He took chances and he recovered well when those chances didn't work. This was the toughest defense he's ever faced and the toughest crowd he's ever seen, both of which showed late in the game. "They were doing a good job, and I got confused," Keenum said. He was sacked four times in the fourth quarter, fumbling the ball twice. The second time he did so, the Chiefs recovered the fumble and thus ended the Texans' comeback bid. From there Kansas City ran out the remaining 1:34 in the game. Keenum opened up a deep passing game that the Texans moved away from lately. According to ESPN Stats and Info, he completed three of five pass attempts longer than 20 yards including one for a touchdown to DeAndre Hopkins. In the previous four weeks, the Texans had attempted only six such passes total. He finished with a passer rating of 110.6, completing 15 of 25 passes for 271 yards and a touchdown. He was sacked five times -- all in the second half -- by perhaps the best defense in the NFL. "I learned a lot today," Keenum said. "That was a big stage, obviously, and a really good football team. I learned that it's those small one or two plays here and there that make a difference." His performance left Texans' owner Bob McNair thrilled. "I thought he did a hell of a job," McNair said. "He was outstanding." It left coach Gary Kubiak feeling like he'd made the right decision when he chose Keenum because the Texans needed a spark. "Yeah, we definitely did [get a spark]," Kubiak said. "We found a little heartbeat today." This week's decision was between Keenum and T.J. Yates, who entered the season as the Texans' backup quarterback. Yates won the backup job in the preseason, but was deposed after a two-interception performance against the St. Louis Rams last week. Keenum was chosen with starter Matt Schaub out with an injury to his foot and ankle that he suffered against the Rams. Schaub said he suffered some ligament damage, but no broken bones. But now the Texans have a bye week, which might give Schaub time to heal. So if he's healthy what do the Texans do? Before this week, my opinion was that Keenum was a desperation choice. Start him if you have nothing to lose. After this game, there might be more there. It's hard to tell, still, what Keenum's future will be. But there are a lot more unknowns about his potential than there are about veteran quarterback Matt Schaub. It's likely Keenum benefited a bit from the Chiefs defense's unfamiliarity with him. It's also likely that as he learns more about reading defenses, he'll get better at it. The answer will lie in which direction pulls him more strongly.